As a Sand Grown 'Un, over the years I have worked for many of Blackpool's tourist attractions, including Blackpool Tower, Coral Island, the Sea Life Centre, Blackpool Pleasure Beach and my current employer Blackpool Illuminations. 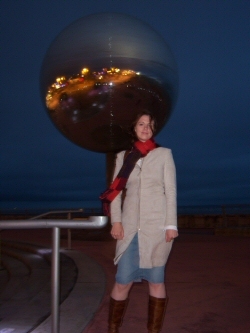 the spectacular Blackpool Illuminations - have you looked at my Blackpool Illuminations Gallery yet? Now where else can boast all that? No wonder it is the most visited seaside resort in Europe! As a passionate supporter I thought I'd put together some pages to help promote the town and tourist industry that has provided (and continues to provide) me with work for so long. Select an option from the menu to view lists of links to Attractions, Accommodation, Events and History and General Information relating to Blackpool and the surrounding area. Note: Like most of my website, these lists will grow over time, so if there isn't much there when you visit the first time, don't give up hope. Come back and check again later! The links within this About Blackpool section are provided solely for convenience. Sarah Myerscough (me) accepts no liability for the accuracy or content of these websites or for any issues arising from reliance upon said content. Nor, by inclusion, do I endorse any product or service advertised on said websites. Should you discover that any of the websites contain inappropriate or irrelevant material, please Contact Me so that I can remove the link. As third party organisations, any of the websites may be withdrawn at any time and without notice.